Hello, my friends! You've been asking for it. Some of you have been waiting a long, long time for it. Remember my awesome online class, Towers and Turrets? Much as I love that class, I won't be offering it again. Instead, I'm excited, delighted and elated to offer my new online class, Bezel Bootcamp. This is the workshop that I'm offering in place of the Towers class. The big difference...this one is all jewelry making. There's a long, long list of things we're going to do in this class so, if you'd like to see the complete class description, click here. My main areas of focus, for this workshop, are making beautiful bezel focals (above) and working with resin. These focals are just so addicting to make! One of the things I love the most about them is the fact that you can use your own images. I take a lot of photographs so this is a big deal, to me. We'll be soldering...yes! I'll show you a super non-intimidating way to torch solder. You'll love it. We'll be doing some metalsmithing, including various cold connections. Everyone wants to learn how to make cold connections, right? Resin, resin, resin... I'll be showing you my tricks for working with resin. Trust me, there are lots of them! ...and open back bezels. And we're even going to do some other fun stuff like learn about resin paper and patinas. So, if you've been waiting for my Towers class...wait, no more. Jump into bootcamp with me! I'll have some more photos for you soon. In the meantime, registration is open. Click right here. I found this cartoon online...but what it doesn't include is the original reason Memorial Day to come into being. Memorial Day was originally known as Decoration Day (love that name!) and was originally a day of remembrance to honor those who died in the Civil War. There were 620,000 of them. That's a lot. A whole lot. That's more than all of our other wars, combined. Decoration Day was first observed in 1868 but wasn't an official American holiday until 1971. After World War I, Memorial Day changed from honoring only the Civil War fallen to honoring all of our fallen heros. It's easy to think that Memorial Day is a day when all of our dead are honored; that's what I always thought, as a kid! Really, it's the day we honor the heros who fell, protecting America's freedom. Fly your flag proudly...and remember. First off, the place is just gorgeous. It's owned and has been decorated by the incomparable queen of shabby chic, Rachel Ashwell. It's spring and the property is covered with rose bushes and other gorgeousness. When we arrived, there were faded little bouquets, everywhere. So shabby and so pretty! Diane and I shared one of the sweet cottages...this is the back porch. There wasn't a lot of time for we teachers to lounge about but doesn't this nook just invite a layabout and a nice glass of wine, in the evening? Inside, our cottage is decorated in bright fluffy comfortableness. The students love it, too. It's such a relaxing and lovely place to hang out, for a weekend. This is a small part of the classroom. And here is Diane. Isn't she cute? Her area is always so neat and organized. Mine looks more like a whirling dervish blew through. The student work that was created was amazing. These are from my "Go Big" class. These are from my "Sacred Heart Book Pendant" class. I'll be teaching this one at Art is You, in Stamford Connecticut, this Oct.
Oh yeah...and the food. The food was fabulous. Here we all are, at Royers...me, stuffing my face with pie. If you missed out, this time, we're doing it all again in the fall. Registration will begin soon. Click here for more info. Pie was had. Fun was had. You can have it too. I hope you join us! ...AND we visited another Houston bead shop called Big Stone. Big Stone is a dangerous place, especially if you like pearls. See those baroques, in the front? They're huge. They were a little costly but you do what you gotta do. I have no idea how I'll use them but they were a must-have. Then, I found a bunch, big bunch, of these amazing little, tiny pocket knives, on etsy...vintage, made in Japan, sweet color of bluish-green. I'll be bringing some of these with me to Art Unraveled, to share on vendor day. I just finished teaching at The Prairie, which Ronnie came to attend. On our way up, we felt compelled to stop at a few antique stores. One of my favorite finds is that teeny weeny bottle. The tag says it was a smelling salts bottle. Swoon. Here I am with my girls at The Prairie: Lorraine George, yourstruly, Diane Cook and Ronnie Grundset. Sweet photo. These are more from our antiquing adventures. I love the anchor crosses. And the rhinestone cross. And the big cross. The big one is a reliquary. An amazing reliquary! A reliquary is a small shrine that's used to hold holy or sacred relics. These relics can consist of many different kinds of materials and usually come from a saint, pope or other religious figure...or are from a special place or article such as dirt from the Holy Land, water from the River Jordan, etc. I don't know the history of this particular reliquary but it contains metal filigree with what look to be gemstones, and each relic is labeled. So beautiful. And, what's more, Sue...at The Prairie...brought an amazing pile of goodies to sell. Bless her heart, she let us dig through her bins. Look at that giant bird brooch. It's about the size of my palm. Not to mention this giant bow brooch. And these amazing, antique-y things. And these things... The emerald cut bracelet was a fantastic find at about $12. I was thrilled. The trillion cut rhinestone pieces are a matching necklace and bracelet, in perfect condition. The piece with the metal roses...so sweet! The rhinestone chain is a light yellow...you can just barely tell. The filigree hearts go all the way to the clasp. This piece is just so charming that I can't take it apart...or part with it. Just looking at it makes me feel like a princess. So, there you go. Last, but absolutely positively not least...I got this lovely bit of goodies, in the mail. Thank you, Andrew Thornton, for making my day a little brighter. Opening this mysterious little package was such a treat. In other news: I'm working on some really exciting things that I'm not quite ready to reveal but, I think you'll be pleased. 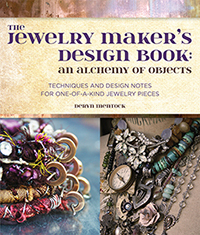 One of them is a brand new online class I'm hoping to have ready for y'all in June or July. And so...back to work! Ok...this has nothing, whatsoever, to do with jewelry making, but I came across an interesting article on parenting, here. The title, "Have American Parents Got It All Backward?" was intriguing. Don't get me wrong, I am SO not an America-basher, and I don't agree with everything the author wrote but, it's an interesting article. I think that, somehow, our culture has promoted a helicopter style of parenting that doesn't benefit our kids, one bit. As the mom of boys, I watched as they constantly did things I considered risky, silly, unwise and downright dangerous. The key being I considered them dangerous. No one else in my household...Wife Whisperer, Number 1 or Number 2...gave it a second thought. So...I had to look the other way. A lot. Wife Whisperer demanded it. The boys demanded it. I wasn't allowed to hover or fuss. Much. They shot potato guns, wrestled in the house, threw rocks at each other and participated in countless other activities that were not mom-approved. And guess what...it was ok. I'm pleased to say that both boys turned out to be independent, reliable, honest and hard working. No one cut off a finger or lost an eye. In fact I seem to be the only one who suffered any ill consequences from their antics...a few grey hairs and extra worry lines. But that's part of being a mom...right?